For those of us that can’t stand to pack up the kayak for the winter where are ways to keep it going all year long. While winter kayaking can be much harder and more dangerous, it is important to remember that if you understand the differences and prepare yourself, you can continue kayaking all year round. Benefits To Winter Kayaking: If you have never been kayaking in the winter or didn’t know it was possible to kayak year round you will be pleased to know that it is not only possible, but there are several benefits you can only get when you are winter kayaking. No Crowds: The waters are much less crowded and can even be completely vacant when you kayak in winter. This is because winter kayaking is not a well known activity and not for the inexperienced kayaker. So if you know what you are doing and want to have a quiet day on the water, it is worth your while to consider winter kayaking. Tranquil Scenery: Without the crowd, the scenery can really be enjoyed and the winter weather creates a lot of new outlooks to the normal nature scenery. The ice and snow can make beautiful, almost art-like creations that are amplified as you paddle through the water and help you feel closer to nature. Wildlife: From October until December you can get a great glimpse of how animals get ready to hibernate or hunker down for the winter, and throughout the rest of winter you can see a variety of wildlife navigating the cold. From deer and moose, to foxes and rabbits, there are many beautiful animals that you can spot from your boat and provide you hours of entertainment. But it is important to remember that these are wild animals and you should respect them and keep your distance. Adventure Awaits: Whether you want a new adventure or an extra challenge, winter kayaking can be a great way to get your blood pumping and give you an adrenaline rush. You must prepare and make sure you have the right equipment for the journey, but the rush you get from being on the freezing water and paddling through the ice is second to none. Risks Of Winter Kayaking: Just like in regular kayaking, it is important to understand the risks involved in winter kayaking and be ready for the worst. To stay safe and be able to focus on enjoying your kayaking trip, you need to respect the dangers winter kayaking poses and how to combat them. There are dangers of kayaking in warm summer days and those dangers can be exaggerated in winter. Hypothermia: The winter months mean water at freezing temperatures and ice all around. The closer you get to the water, the colder the temperatures and with the splashing of water from your paddle, your body temperature will quickly lower and you have to worry about hypothermia. It is important to remember that just because you haven’t fallen into the water doesn’t mean you can’t get so cold being so close to the water to get hypothermia. Getting in and out of the kayak can also expose you to freezing cold water. All of these factors means you need to dress appropriately, have a way to warm your body up quickly, and you should have someone with you so if you do need help you have access to it. Getting In Over Yours Head: It is important to remember that kayaking through icy water and cold weather will be more difficult to paddle through than the normal kayaking conditions. To keep yourself moving through the added obstacles it will take a lot more energy and upper body strength so it is important to prepare yourself with the proper fuel and make sure you don’t overdo it. For your first couple trips you should stay close to shore, bring a friend and make sure you can get back to shore easily. You can increase your distance every journey, but paddling miles out and not having the strength or endurance to bring it back is a very dangerous position to be in. Not Being Prepared: You need to always be ready for the worst and know how to handle it when things go south. As with any kayaking trip, you need to wear a lifejacket or PFD to prevent drowning, but you need to also prepare for the difference in climate. This means wearing a dry-suit, layering clothing and making sure that your body will handle the extreme cold. You also need to make sure your equipment is going to handle the cold and be prepared to stay warm if you get stuck somewhere. When Is It Not Safe To Kayak: During the winter there can be snowstorms, blizzards, freezing rain and a whole plethora of other things nature throws at us. A good rule of thumb is to consider if you would feel comfortable driving in the weather. If you have to consider it, you should postpone your trip and wait for a better day. Can My Kayak Handle The Cold: Inflatable kayaks or kayaks that are not designed for intense rides are not ideal for winter kayaking so you should always look on the website or contact the company if you aren’t sure your kayak will make the trip. But no matter what type of kayak you have, it is important to always inspect your equipment and make sure everything is in good shape before getting on the water. This means checking your kayak and paddle to see if there is any sign of warping or cracks. 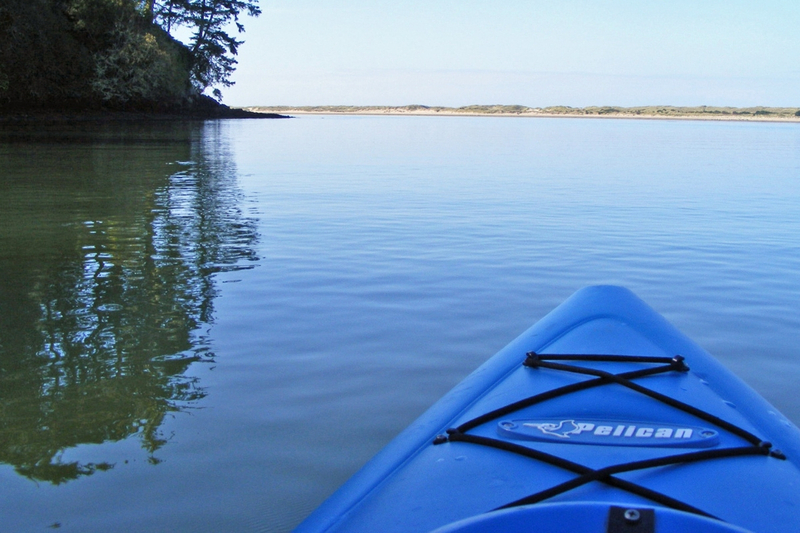 Plan Ahead: There are several things you should consider and do before every kayaking trip. Because of the added risk it is crucial that you plan your trip very carefully by checking the weather, packing the proper equipment, and making sure someone knows when and where you are going to guarantee if you need help there is someone able to look for you. You should also plan to bring a change of clothes so after your journey you can get out of wet clothes and get warm. Go Slow: It is important to kayak in winter gradually so you don’t overdo it and get in over your head. While it is still kayaking, winter kayaking can be much more challenging both intellectually and physically and you should start slow with short journeys close to shore. As you get more practice you can increase your distance and build up your endurance until you are comfortable with long journeys. Put Safety First: If you are kayaking in any condition you need to wear a lifejacket or PFD. Things can go wrong quickly and it is important to do everything you can to protect yourself. You should also pack a first aid kit and have it in a dry bag in your kayak for every trip. Another drybag with a spare change of clothes, blanket, towel and matches to start a fire if need be to stay warm. Practice: One of the most crucial parts of kayaking safely is learning to enter, exit and re-enter the kayak both in shallow water and deep water. You should practice this when the weather is warm and do it until it is second nature so if you need to do it in an emergency, like falling into freezing water, you can execute it quickly and effectively. Stay Within Sight: Kayaking in winter should always be done where you can still see the shore. This not only makes sure you won’t get stuck somewhere on the water from exhaustion, but keep you from getting lost on the open water. This is especially important in large bodies of water like the ocean as you can get lost quickly and end up stuck. How To Dress For Winter Kayaking: The biggest threat to you when kayaking in winter is hypothermia. The water is freezing cold and you need to be ready and keep your body warm enough to function. – Invest In A Dry Suit: While you may already have a wetsuit for your kayaking, a dry suit is the best option for cold water kayaking. This is because it is a one piece suit that is waterproof and helps you retain your body heat by keeping the cold water off your skin. If you don’t want to buy a dry suit there are individual dry pieces of clothing like tops, pants and bibs. But no matter which you choose it is important to have dry clothing to keep your skin dry and not exposed to the freezing water. – Stay Insulated: While dry suits are a great way to stay dry, they offer no insulation to help keep you warm in the winter. This is why it is so important to wear layers both under and over your dry clothing during the extreme cold. – Keep Your Head Warm: The majority of your body heat escapes from your head so it is important to keep your head covered and warm. The easiest way to do this is to wear a hat. You may want to wear a ski mask or balaclava to get full face coverage, but at the very least you need an insulated hat that is tight enough to stay on and keep you warm. The last thing you want is a wet hat if it falls off. – Protect Your Hands: At the very least you need to have water proof gloves made out of the same material as a dry suit, neoprene. This is because you want to keep your hands warm and the circulation flowing as you paddle. But the colder the weather, the more layers you need. This means wearing gloves underneath the water proof gloves. It is not advised to wear the additional layers outside the neoprene because non-water proof gloves can become slippery and make it difficult to grip your paddles. – Keep Your Feet Warm: Some dry suits may incorporate socks into the clothing, but if you do not have them you should purchase water proof socks. Wool socks, the thicker the better, should be worn under the waterproof socks and you can even buy neoprene boots to wear. But it is crucial to keep your layers on your feet loose enough to allow proper circulation or you will end up with more problems and make you feel colder. – Bring Your PFD: A lifejacket or PFD is a requirement for any kayaking trip because it keeps you safe from drowning in emergencies, but it also provides an extra layer of warmth. The more layers the better to keep you insulated on your trip so concerned the added warmth a bonus. – Have A Spare Pair: You should keep a spare pair of everything in your drybag as well as your vehicle to make sure you have something warm to change into, or extra layers if you need more on the trip. You never want to be stuck with wet clothes or stuck in the water with not enough layers to stay warm. –Other Accessories You Need: Other optional items you may want to invest in are rash guards. These are quick drying polyester or spandex that prevents chaffing and allows you to move freely without feeling uncomfortable in the dry suit. How To Store Your Kayak In Winter: Kayaks should never be left outside without cover in any weather, but in the winter it is important to keep your kayak safe from the extreme cold. This means preparing your kayak for the winter and store it to accommodate the kayak’s needs. Storage Rack: Your kayak should never be stored on its hull. This is because it can warp the kayak and make it difficult to use. To prevent any issues you should install a storage rack to keep your kayak off the ground. Wall mounts come in many different styles and they can accommodate many different places so there is a model out there for every situation. Spray Protectant: You should always wash your kayak and paddle after every trip out and then dry it thoroughly to prevent mold, mildew and bacteria. Once the kayak is dry it is important to spray it with a protectant. This will keep your kayak in good condition and have it ready for the next use.